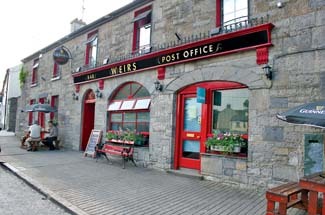 Pat and Una Weir’s handsome stone pub & restaurant is a good spot to relax in. It’s a typical old-world pub where all the local news is up for discussion, it’s full of charm. 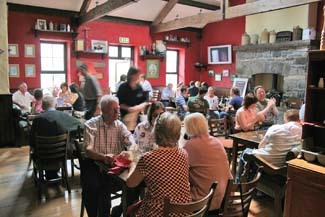 With a relaxed atmosphere, friendly service and good food, what more could you ask of a country pub? Seats 60 (outdoors, 8; private room, 20). Meals: Wed-Sat, 12.30-8.30 (day menu to 7, à la carte 6-8.30); Sun, 12.30-8pm, set Sun L €17; value D 5-7pm €20, also à la carte. Children welcome (high chair, childrens menu, baby changing facilities); free broadband wifi. Fri night live music, popular folk acoustic. No food served Mon (except bank hols) & Tue. Closed Good Fri, 25 Dec. MasterCard, Visa, Laser. Multyfarnham is a delightful traditional village in the gloriously unspoilt rolling countryside just north of Mullingar, and near Lough Derravaragh – where the mythical Children of Lir spent 300 years of their 900 year exile. 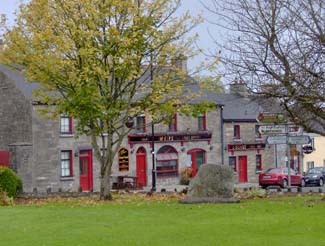 Complete with a 13th-century Franciscan friary (with life-size Stations of the Cross in the grounds) and a pretty river with a charming stone bridge, it’s a village well worth seeking out – and when you’re done exploring, Pat and Una Weir’s handsome stone pub and restaurant is a good spot to relax in. It’s an atmospheric place, especially the friendly front bar with its welcoming fire. A typical old-world pub where all the local news is up for discussion, it’s full of charm. Behind it you’ll find a surprisingly large restaurant, which has a well-earned reputation for good home-cooked food, notably steaks (Angus sirloin, Hereford fillet), while other specialities include their own home-smoked mackerel, attracting regular custom from miles around. The Weirs take pride in using as much local and organic produce as possible, with daily specials focusing on seasonal availability. Everything is homemade, including desserts – anyone for dark chocolate fudge cake and raspberry coulis or warm apple pie and cream? Or if you’re very lucky they’ll have a Snickers cheesecake on special, which is a favourite with customers and staff alike. It’s all homely in the best possible sense, meaning simple, well cooked and tasting of itself. There’s a short children’s menu too (€5). A short wine list is well-chosen to match the food and well-priced. They also serve a small range of Irish craft beer and cider. 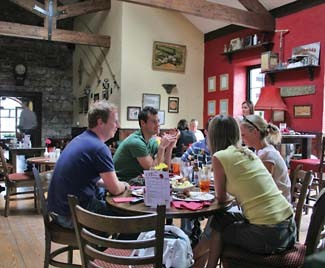 With a relaxed atmosphere, friendly service and good food, what more could you ask of a country pub? Well, a bike for hire, actually – or a boat, with gillie and packed lunch, maybe even a house to let. Now that’s service.